This week was crazy. Wednesday was particularly crazy. 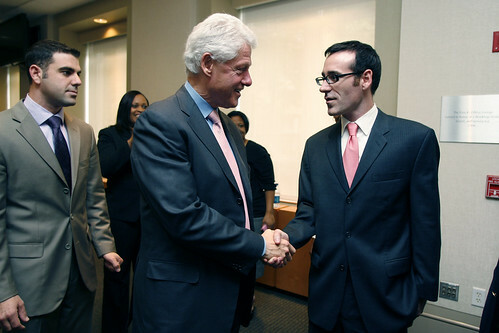 I shook Bill Clinton's hand and mumbled, "Thanks for everything," which I really mean / meant. I almost mispronounced my own name. I can't believe how nervous I was, but I guess I can. Had I not been surrounded by folks -- many of whom are my clients -- I probably would've been a lot more collected. Cool!!! I think that's a pretty great thing to say in that situation. And it's not easy to have an audience. Jamie: What a great picture!!! Regardless of politics, it is a truly awesome experience to meet a former president. Oh, and I forgot to say you're too cool. good tie. I was going to say nice tie but that would sound sarcastic.